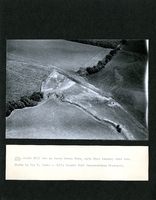 Earth fill dam on Harry Evans farm, with farm roadway over dam. 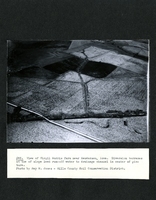 View of extremely bad erosion in field of Leo Cheney farm, largely caused by unusual storm of February 1948. View of McGinnis farm from west. Two terraces around the top of hill, contour boundaries and contour planting will not control the run-off until more humus is added to the soil. 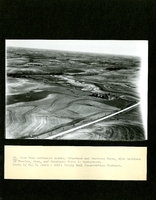 View of Virgil Morris farm near Henderson, Iowa. Diversion terraces at the top of slope lead run-off water to drainage channel in center of picture. 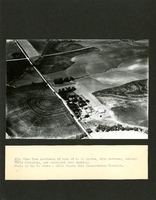 View of Dwight Buffington farm with Will Van Orsdel farm in left background. The dark terrace line in Buffington farm is a large diversion terrace that keeps hill run-off water from the valley bottom. View from north of J.F. Wearin Jr. farm. 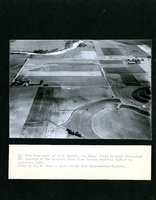 Field in right foreground was location of the nation's first Plow Terrace Building Contest in September 1942. 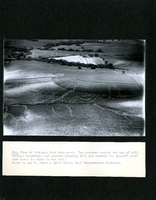 View from the southwest of home of D.N. 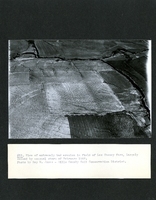 McGrew, with terraces, contour field diversions, and contour corn showing. 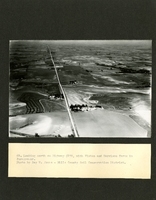 Looking north on Highway #275, with Vinton and Harrison farms in foreground. 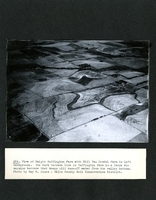 View from northwest showing Utterback and Harrison farms, with terraces on Wheeler, Horn, and Munsinger farms in background. 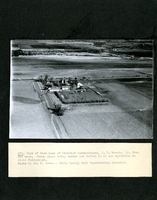 View of farm home of District Commissioner, J.F. Wearin Jr. from the west. Brome grass being seeded and rolled in at one operation in right foreground. Photo taken by Ray W. Jones - Mills County Soil and Water Conservation District Office.